flexibility to enjoy Spokane, after dark. Use your images in your home slide programs, or on any size electronic digital frame for revolving looks at Spokane. Print and then frame your own local photographs and poster sized wall art! the images on each DVDR. Some of the images on your DVDR are original and have not been presented on the web. Poster sized DVDR images may be printed as large as 60" X 85". 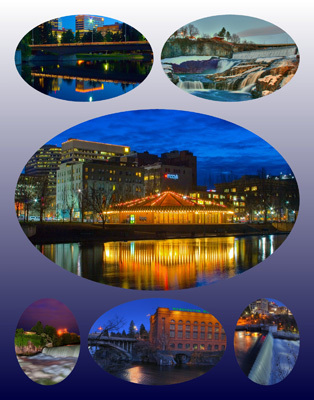 Your Spokane Night Scenes DVDR contains 435 JPEG image files, and is 3.36GB in size ($315.95 US). This is a non commercial use DVDR. If you need assistance with any of the Spokane Night Scenes images, contact the Spokane office. We can edit any additional images you need for your project. It is likely we can transfer your edited (larger) images to you by email. More than 3 prints? Save 15% on your order. "Commercial use of any individual image or any portion of our digital photographs requires a contract and/or a licensing agreement. Commercial contracts and releases for authorized image use last for a period of one year. Commercial agreements/releases for image use are subect to renewal one year following the initiation of each separate or individual agreement. " Please download our email transferable release request/proposal form (PDF)."